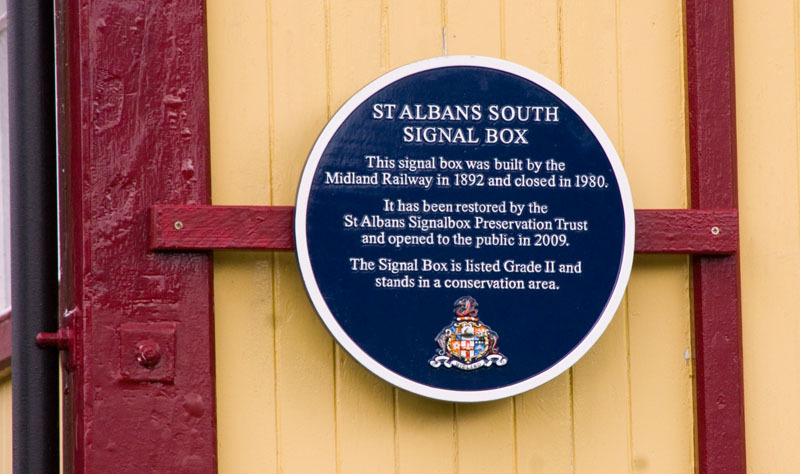 The St Albans Signal Box Preservation Trust have now restored St Albans South signabox on the Midland Main Line. Do go along - it is open two Sundays each month in the summer, an easy walk from the station, and free admission. 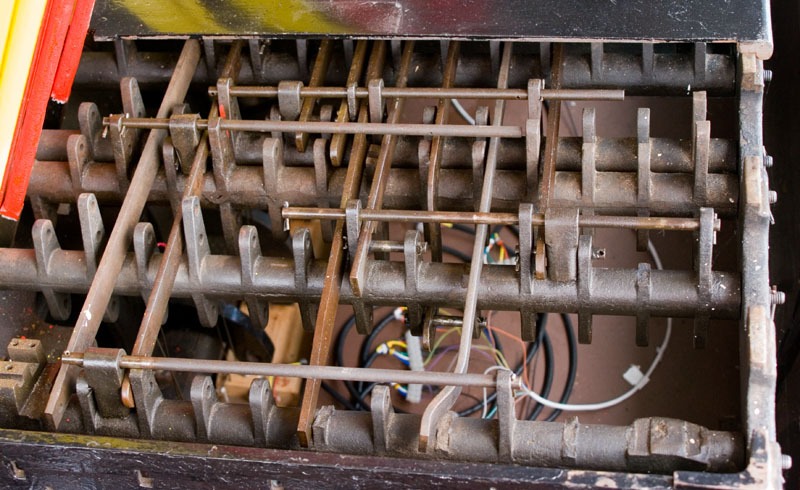 Inside the box, including the original lever frame and block instruments. 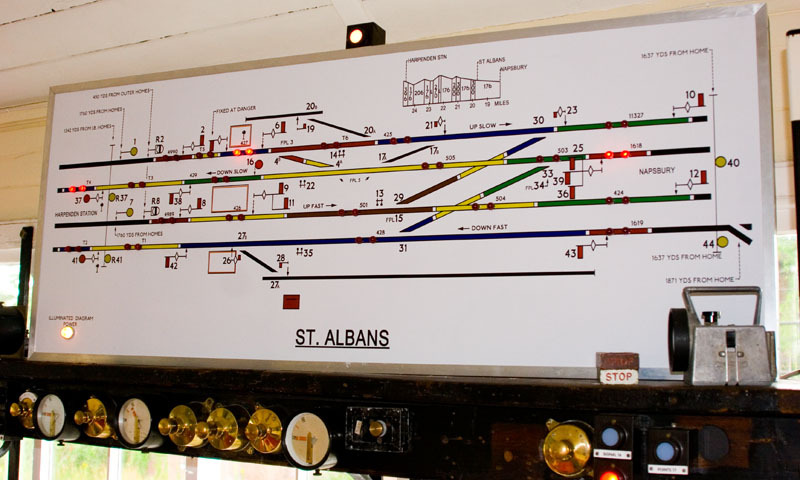 The diagram, with the track and signal layout as it was shortly before 1979 when the layout was rationalised prior to West Hampstead panel taking control of the area as part of the 'Bed-Pan' electrification scheme. 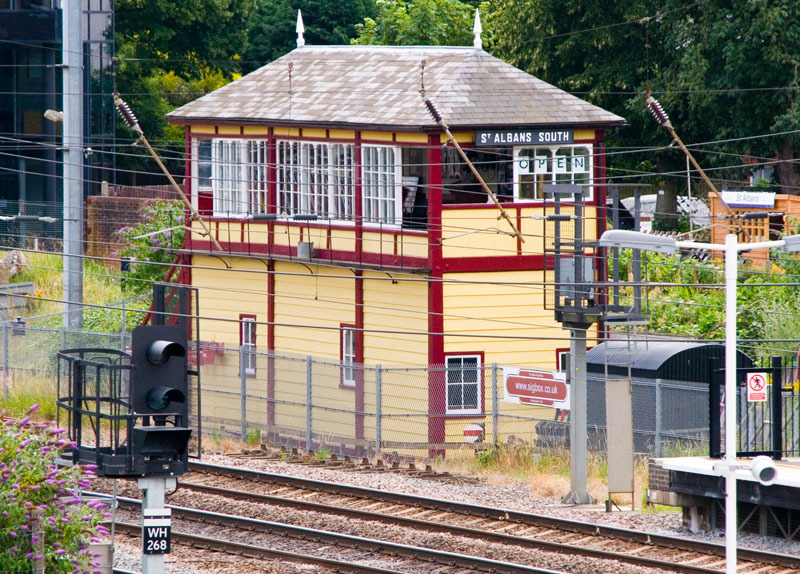 The box worked to Napsbury to the south and Harpenden Station to the north. The block instruments and bells. 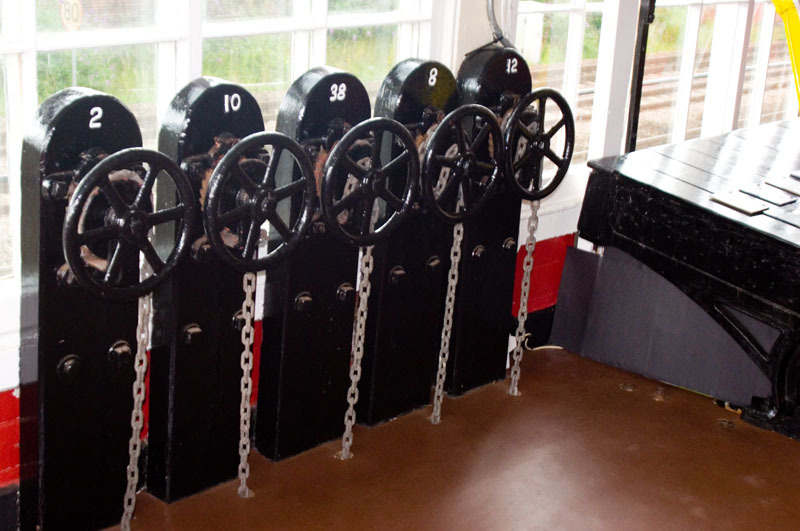 The ones in wooden cases are Midland Railway Rotary Block instruments - this type remained in use between here and Napsbury on the fast and slow lines until closure. 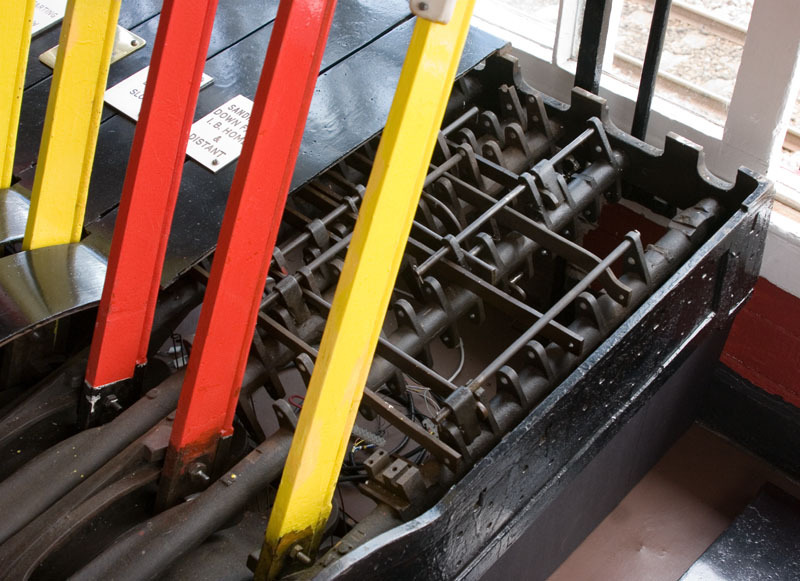 Three of the cover panels have been removed so we can see the workings of the Midland tumbler locking. 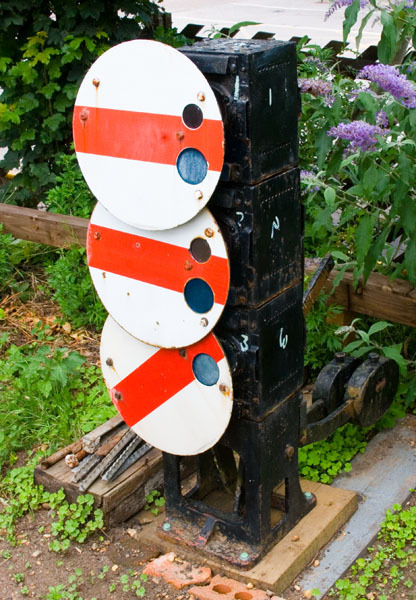 This prevents signals or points being worked if they would conflict with another move. The same interlocking viewed from the side. A view of the box from the same end. 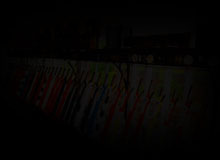 These adjusters allowed the wires to the signals furthest from the box to be taken in or let out according to the temperature - like most things, signal wires expand at warmer temperatures. 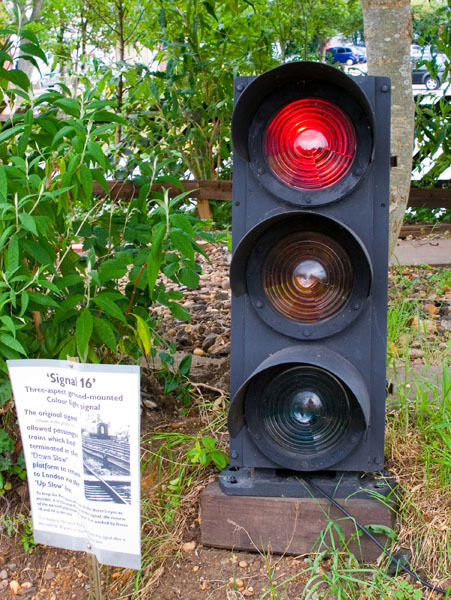 Signal 16 was a relatively late addition to the layout and was therefore provided as a colour-light signal. Located at the London end of the down slow platform, it allowed terminating multiple-unit trains to depart directly back towards London without having to do any shunting. 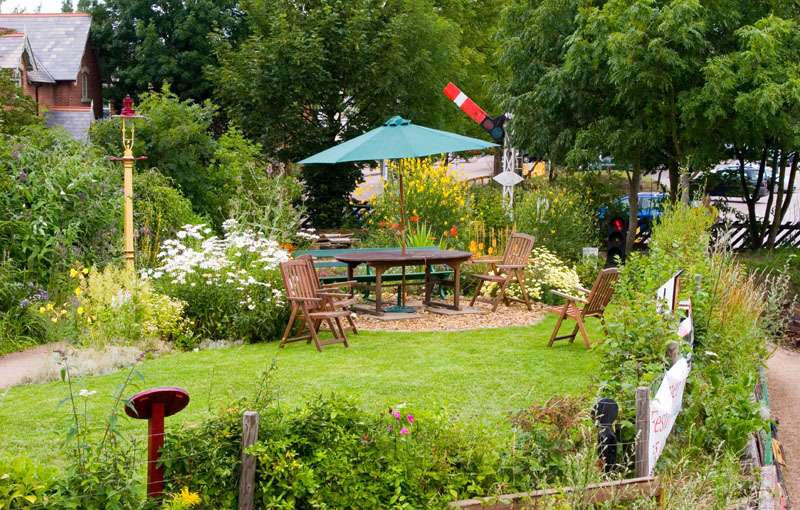 My plaudits to the Preservation Trust for turning the immediately adjacent ground into this pleasant, colourful garden. 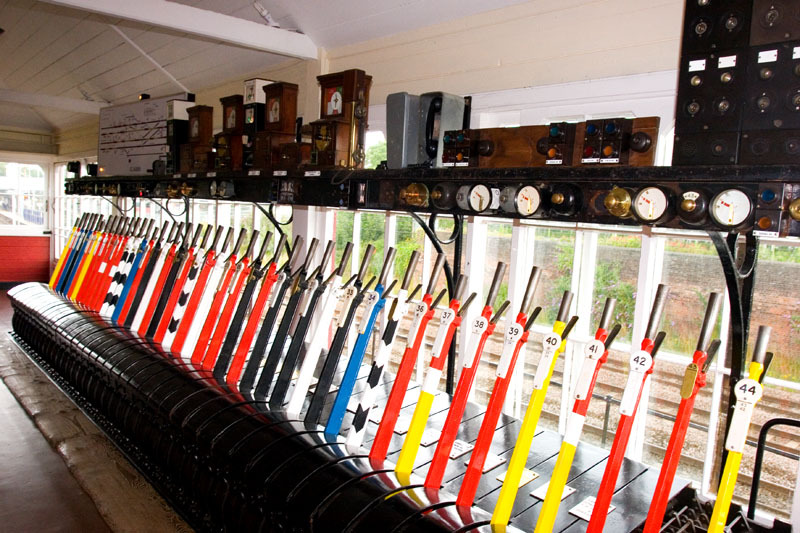 The semaphore in the background has been wired up to a lever in the signalbox. 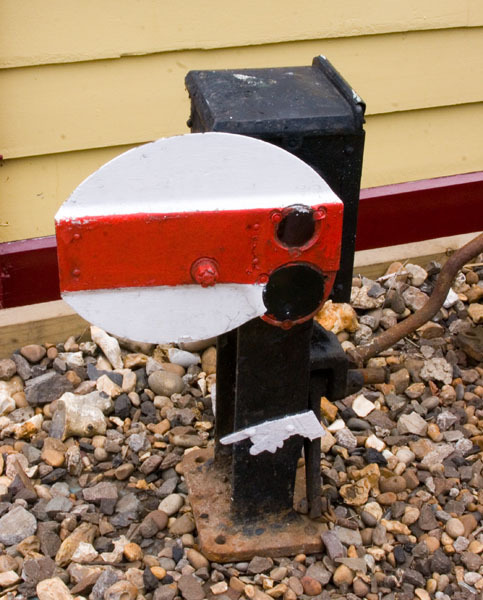 The Trust have also made an effort to make the exhibits here family-friendly, for example they have counterbalanced this signal's lever so it can be worked easily by youngsters. ...as is this ex-MR example. 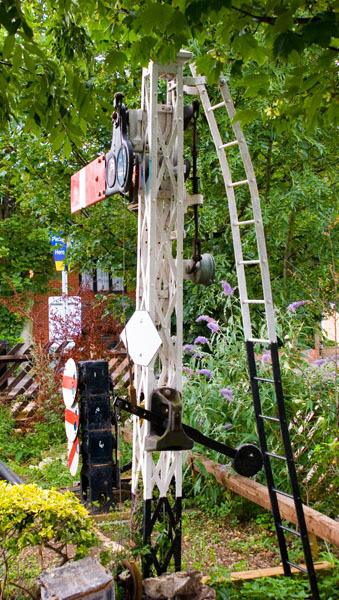 A side view of two of the preserved signals. An up suburban train departs on the up slow. 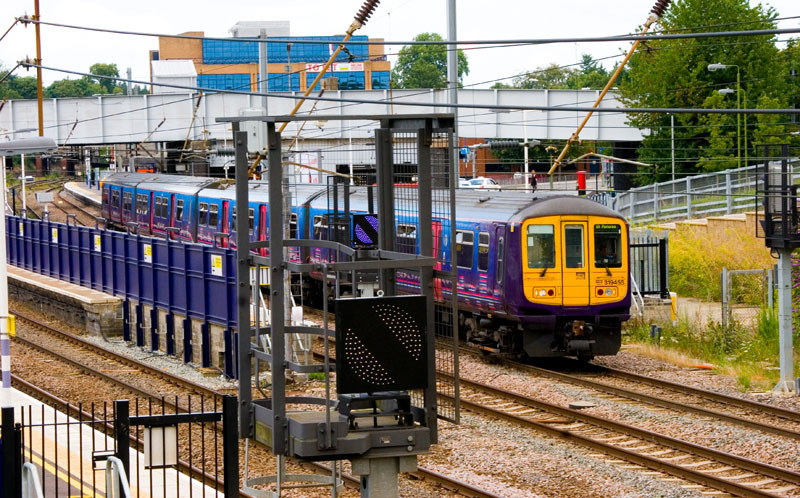 In the foreground, two modern-style fibre optic banner repeaters can be seen, repeating the signals at the far ends of the down platforms. 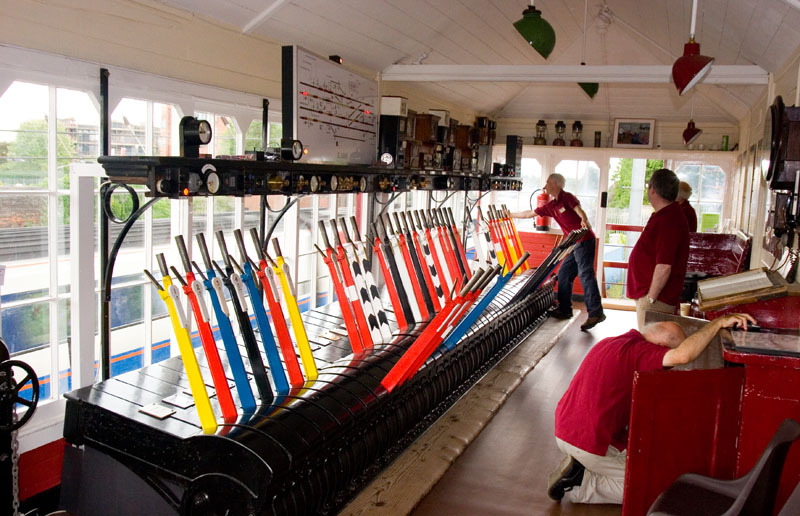 This multiple-aspect signalling demonstrator steps through the aspect sequences that would be seen as trains travelled along past the signals. 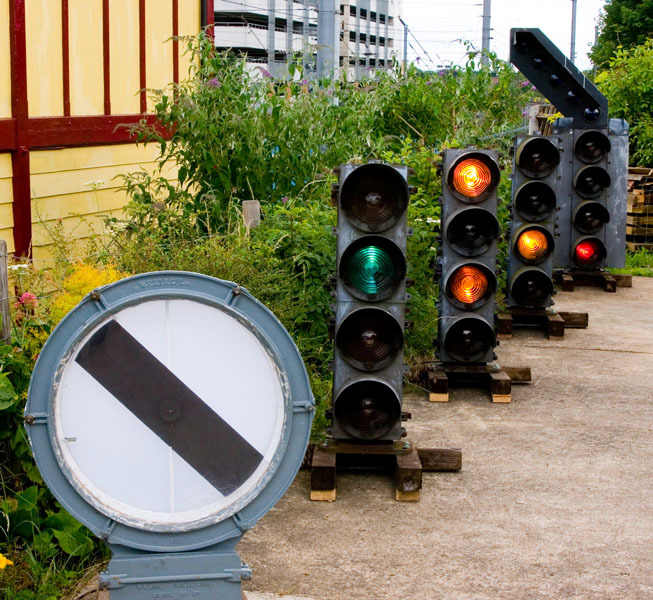 Here I've caught it displaying the classic sequence leading up to a red signal. 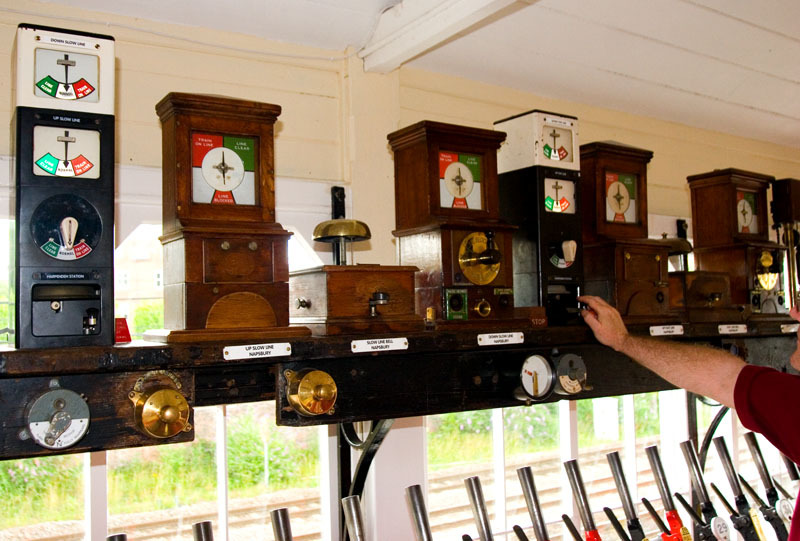 More information about the history of the box can be found on John Hinson's Signal Box website.